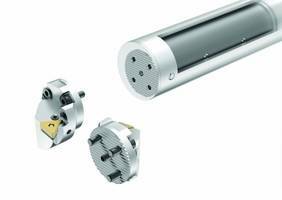 The New Boring System includes a serrated, bolt-on connection at the bar’s business end for securely clamping various styles and sizes of indexable heads. The system is coolant-fed that directs steam of high-pressure coolant. The bar consists of a mass inside it that vibrates at a predetermined frequency during machining and attenuates natural frequency of the bar around it for suppressing vibration. Walk into most any machine shop and there’s a good chance you’ll hear it: the high pitch whine of a deep boring operation, the chatter loud enough to have even the most hard of hearing among us scrambling for a pair of ear plugs. It’s a problem that has plagued machinists since the day lathe inventor Henry Maudslay first chucked up a piece of steel and tried to bore a hole through it, and has only gotten worse as metals have grown tougher and more challenging to machine. to precisely direct a stream of high-pressure coolant where it’s needed most. The result is hassle-free chip control together with maximum cooling in the cutting zone.